Polish navy Cmdr. 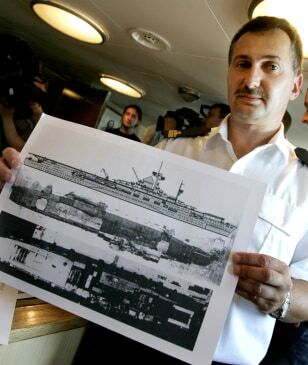 Dariusz Beczek holds up images of the wreck and of the Graf Zeppelin, which was last seen 59 years ago. The top image shows a Nazi-era drawing of the ship, the second a sonar picture made this week by the Polish navy, and the last, a photograph made in the 1930s during the building of the ship.